Clone Troopers Battle Pack is a Star Wars Episode III: Revenge of the Sith set released in 2007. The set features two models- a speeder and a turret. The speeder is primarily grey, with some red present. It can accomodate a total of two minifigures- one as the driver, while the other's role is a gunner who faces backwards. The speeder has handlebars for the driver to hold on to, and is armed with two laser cannons, one mounted on each side just in front of the driver. The turret is white and red, and has a base for the turret operator to stand on. The turret does not have any fixed weapons, instead it has a cone piece on the top of it, where a trooper's gun can be placed in. 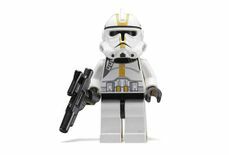 The set includes a total of four minifigures- a Star Corps Trooper with a blaster, a Shock Trooper with a blaster rifle, and two Clone Troopers- both with blasters, and one of them additionally with a pair of electrobinoculars. The Grand Army of the Republic outfitted and equipped its clone troopers with a variety of weapons, vehicles and defensive platforms during their battle against the Confederacy of Independent Systems in the Clone Wars. This set was one of the first to include guns in a newly mould parts x1740 (a blaster) and x1741 (a blaster rifle). 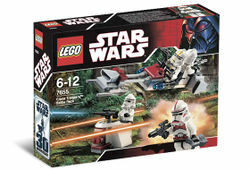 It was released alongside with the set 7654 Droids Battle Pack as one of the first Battle Packs, in January 2007. This is a description taken from LEGO.com. Please do not modify it. Send in the Clones! The Clone Wars are on! When the Separatists attack, the Republic fights back with its legions of Clone Troopers. Build your army with an assortment of battle-ready troopers, complete with a blaster turret and speeder bike! 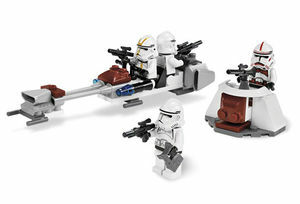 Set includes Shock Trooper, Star Corps Trooper and 2 Clone Trooper minifigures. Build your own army and stage a battle against the #7654 Droids Battle Pack! Facts about "7655 Clone Troopers Battle Pack"
ShopDescription Send in the Clones!